My review for Audubon newsletter:I’ve recently started going on Saw Mill River Audubon's Monday morning bird walks. This has opened up a whole new world for me. As a beginning birder, I've learned more than how to distinguish between different species of birds (like the White-throated Sparrows and White-crowned Sparrows that showed up one Monday).What the more experienced birders who participate in the Monday walks are teaching me is how to find birds—any birds—in the first place. Birds that eluded me on solitary walks on these same trails have been there to be seen (or heard) on Monday morning.The tips and tricks my fellow Monday walkers seem to inately know are summarized in The Art of Bird Finding by Pete Dunne. This fine little book is not a field guide. It is, rather, a guide to using your eyes and ears in the field in new ways—to see and hear what you missed before—to, as Dunne says, open your heart to the experience of finding birds.The Art of Bird Finding explains, for example: the meteorological conditions that concentrate birds; what constitutes bird-friendly habitat where birds are more likely to be found; and how to use flocking behavior to increase your species count. There are brief sections on seeing more on hawk watches and pelagic (ocean) birding trips.Sharply written, The Art of Bird Finding is an enjoyable, often humerous, read. In the book, Dunne, an accomplished birder with more than 50 years experience, engages the reader in an informal conversation that will help any birder, especially a beginner like me, "to become more atuned to the natural world and develop a level of intimacy" with it.So, join us on our Monday morning bird walks and read The Art of Bird Finding. Both will open up new worlds for you. Great book for birders starting out, but too general for the intermediate. I admit I was looking for details neglected in the usual field guides: the kind of specific flora where certain species are likely found, how (when and where) to go owling. Imagine my frustration when flipping page to page and only finding tips of field markings, the different kinds of habitats, listening to birdsong for clues, and walking lightly. That said, Pete Dunne is a witty writer! I really enjoy his humor. This book is more about guidelines for common-sense birding. Fair enough. Short but packed! I recommend this to new birders or those who are getting frustrated. 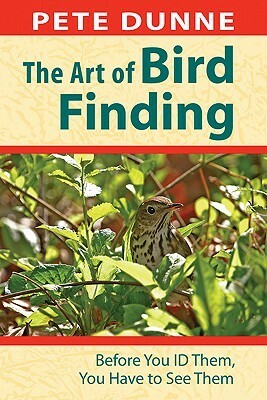 If you're frustrated or clueless, as I was, about where and how to find birds, this book offers lots of good advice, tips, and direction. I've read at least three of Pete Dunne's books now, and they've all been super helpful tools. Pete Dunne's many books on birding are known for clear and sensible advice, and this compact one is no exception. His guide to habitat runs from the large-scale (ex. peninsulas and migration corridors) to ultra-small scale (ex. shrubs) and there's plenty for even a fairly skilled birder. Highly recommended for those seeking to improve their birding abilities. The first three chapters are great for beginners, but chapters 4 & 5 offer something for more experienced birders. As usual, Pete Dunne blends entertainment with education and creates an enjoyable book. Excellent practical advice for birding. His tips often seem obvious once you've read them---common sense, but not until you learn it. Highly recommended.